For the record, I do not hate Wikipedia, as I tried to make clear here. As a showcase of communal knowledge, it is astonishingly interesting and useful. But it is also, alas, a showcase of communal knowledge, which can lead to complications. Twenty years ago, while working at a mental health clinic in Denver, psychiatrist Paul Polak asked himself a question that has crossed the mind of most of us at one point or another: Why are the poor so poor? Unlike most of us, who answer that question with a shrug and a fatalistic “The poor are always with us.” Polak decided, first of all, to seek a more useful answer, and second, to do something to change the situation. One of the frequent critiques leveled against those of us in the progressive community is that, due to our engagement with the political process, we are simply engaging in a Constantinianism of the left. This critique invites a couple of questions. First, what exactly is “Constantinianism”? And, second, why is Constantinianism a problem? To answer the these questions, we need a very short brush up on church history. There is some really good stuff in this article and it encourages me that Jim Wallis is the one who highlighted the article. Tony Campolo and Ron Sider are two people often considered to be in a similar league with Wallis. Campolo has always sought to be in conversation with a broad range of Evangelicalism. Ron Sider has a long history of constructively engaging Evangelicals who politically disagree with him. Two recent examples: Two years ago Sider was co-editor of Toward an Evangelical Public Policy, with the late Dianne Knippers, executive director of the Institute on Religion and Democracy, an organization many progressives revile (mainline types to the point of hysteria.) Last October, Sider went to Grand Rapids to debate Robert Sirico of the Acton Institute. I wish we would see more of this engagement coming from the Sojourners community. I have been acquainted with Sojourners for almost three decades. I have read their materials off and on. In recent years (and especially in the last year), I have virtually quite reading their materials altogether (although I still get Sojo emails.) They attempt to position themselves as a “third way” for Evangelical politics. Frankly, I now see them more as the Christian Coalition or the Moral Majority arm of the Democrats. I'm glad Jim Wallis highlighted this article and maybe it indicates a different wind blowing from D.C. I hope so. This 17 minute clip by Danish economist Bjorn Lomborg is about economic priority setting and major world issues. It acknowledges the problem of climate change along with more than a dozen other problems facing the world. Lomborg says that not every problem can be solved nor can every problem effectively be addressed at the same time. Some projects make very little improvement with large amounts invested. Seem projects make improvements nearly equivalent to their investment. Other projects give a return several times higher than the investment made. Which ones are which? This presentation is entirely too well reasoned to garner an Oscar but I say check it out anyway. Good stuff! Our longtime friends Lowell and Carol drove in from Manhattan, KS, on Saturday. Together we went to see the movie Amazing Grace about William Wilberforce, the lifelong champion of abolishing slavery and advocate for social change. The movie is exceptionally well done. Here are three thoughts I had watching the movie. First, Wilberforce frequently found himself trapped between the dominant forces of society who benefited from slavery and radical elements that saw revolution in American and France as the wave of the future for England. His vision of a more noble and redeemed England was stronger than either of these competing forces. I read recently that economic historians have sought for years to offer an economic explanation for why England abolished slavery how and when they did. The historical consensus is that the change was actually economically detrimental (though not devastatingly so.) The change came because of moral suasion, not economic imperative. Second, Wilberforce was a flawed but godly human being. Importantly, he was also a human being in community with others who shared the vision God had given him. Wilberforce was a great and persuasive speaker but he was speaking out of a community with a vision. Third, like the Apostle Paul, Wilberforce accessed and used what political and economic resources had been placed at his disposal to do the work of God where God had planted him, rather than opting for some type of sacred/secular split that would suggest he should serve God in “full-time” ministry. Wilberforce was doing full-time ministry where God had placed him. I think if there is any danger in this movie it would be to tempt the viewer into thinking that they can't do what Wilberforce did when in fact they can. They can be "Wilberforce" with the political, economic and relational resources in the place where God has placed them. The movie is well worth seeing. While the topic is slavery, there are not a lot of graphic disturbing images. For that reason I would feel comfortable bringing children down to grade school age. You might do well to read a short bio about Wilberforce before attending. The movie tends to jump back and forth across the timeline of Wilberforce’s life and I found myself lost a couple of times with regard to what era we were viewing and how to contextualize the events. That was one of my few (and minor) complaints. I may go see it again. There is a lot to reflect on in this movie. ...Not that I have no thoughts about that subject. When I was a teenager, Bernard Ramm’s A Christian View of Science and the Scripture was quite controversial in my part of the evangelical world. So I read it, and he convinced me that something in the neighborhood of “progressive creationism” and “theistic evolution” was quite acceptable for those of us with a high view of biblical authority, and that is where I have been on the subject ever since. So if anyone asks me, I feel quite free to say that I do not believe in a literal six-day creation, and that an acceptance of the Genesis account is quite compatible with a belief in evolution. National Bureau of Economic Research: Minimum Wages, the Earned Income Tax Credit, and Employment: Evidence from the Post-Welfare Reform Era by David Neumark and William Wascher. Here is an abstract with my emphasis added. I may have to buy this report and read it. I would be curious to know more of the specifics. From where I sit, it is young low-skilled minority men about whom I am the most concerned. Jan. 12, 2007 issue - Last Friday, the Intergovernmental Panel on Climate Change, the United Nations group charged with assessing the state of the world's climate, unveiled the summary of its latest report. The IPCC Web site claims an impressive number of participants: 450 lead authors, 800 contributors and 2,500 expert reviewers (of which I was one). But it would be a mistake to assume all these experts endorse everything in summary, including its bottom-line assessment: "Most of the observed increase in globally averaged temperatures since the mid-20th century is very likely due to the observed increase in anthropogenic greenhouse gas concentrations." Many disagree with the conclusion itself or the claimed level of certainty, but the fact is, we were never asked. Most participants worked only on small portions of the report, handed in final materials last summer and never ventured an opinion on claims made in the summary. This article was recently brought to my attention. It is written by Ross McKitrick who is one of the two scientists who demonstrated in peer reviewed articles that the statistical methods used to generate Al Gore's Hockey Stick Effect would generate the Hockey Stick Effect out of random data. (Click here for article.) It is my understanding that the new IPCC document may be backing away from that claim but now, based on one study, they are going to claim there has been no change in solar radiation since the 1700s. What this article should point out is how deeply political the IPCC report is and how absurd the claims of certainty are. The mantra is “It is time quit debating whether global warming is happening, and decide what we are going to do about it.” A step is missing in that logic. The global temperature has oscillated throughout the twentieth century to rise about 1 degree Fahrenheit. So yes, global warming has happened. But to ask what we are going to do about presumes something can be done about. What if nothing can be done? What if it is a natural event? To therefore insinuate that those who question the degree of human impact on warming are denying that warming is happening is disingenuous. The uncertainty is about the causes of the warming and the projected impact of further warming should it happen. This places us in a risk management dilemma, not a scenario of certainty with people living in denial. To bully, demean and intimidate those who are trying to responsibly assess the situation by placing them on a par with “holocaust deniers” (ala Ellen Goodman) is little more than eco-McCarthyism. We are told to be leary of the claims of Big Business as they seek to protect their interests from regulation. It is a valid warning. Every bit as valid as being leary of the claims of Big Science, which stands to lose billions in funding and prestige if GW should turn out to be a natural event. There are few neutral parties at work here. Well, so much for the Gates kids' allowance this week. ADDIS ABABA, ETHIOPIA - Imagine if Ethiopia, that land of skin-and-bone children that defined African famine in the 1980s, could turn from the world's largest recipient of food aid into a bread basket, not only feeding itself, but its neighbors also. Ethiopia actually produces more maize than east African neighbors Kenya, Uganda, and Tanzania combined, but since most Ethiopian farmers are subsistence growers, only 30 percent of that food actually reaches the market. The quickest way to change this, says economist Eleni Gabre- Madhin, is to bring profit back into agriculture, to give Ethiopian farmers enough information so that they can grow what the world wants and get paid more for growing it. TO WHOM does William Wilberforce—the best-known figure in the British campaign to end slavery—belong? As with many historical figures, his mantle is contested by devotees of different political hues. To progressives, he was, of course, a pioneer of campaigns for social justice. To modern British Tories, he embodies a sort of compassionate conservatism of the kind that the party's present leader, David Cameron, is keen to proclaim. FOR the first time in years, Washington is talking about big changes in health policy. In his recent budget, George Bush took aim at the $200 billion tax subsidy for employer-purchased health insurance. He wants to replace it with a standard (and limited) deduction for everyone who buys insurance, which would help control health-care costs and boost coverage. His budget also chops at Medicare, the government's health plan for the old, cutting payments to providers and making richer old folk pay higher insurance premiums. Top congressional Democrats have denounced both proposals, but are themselves talking big about health care. Pete Stark, the top man on health in the House of Representatives, wants to move America towards a single-payer system by allowing everyone to buy into Medicare. That idea has scant support beyond the party's extreme left. Ron Wyden, a senator from Oregon, is pushing a more centrist approach. He wants to cut the link between employment and health care by replacing today's tax subsidy with a standard health-care deduction and subsidies to help poor people pay for insurance, which everyone would have to buy. "Why is the Emerging Church drawn to Deconstructive Theology?" I'm not sure how soon or exactly where they are going to post my response, but here it is so we can go ahead and get started on our own conversation! I see at least three emphases within “deconstruction” – understood broadly in the sense proposed by Caputo – that would naturally be attractive to Emergent Types (hereafter ET). Here's the magazine's [US News and World Report] list of the nation's 10 worst presidents. Roger was Executive Presbytery of Heartland Presbytery when I was presbytery moderator in 2001. I had the opportunity to work extensively with him. He left Heartland Presbytery a few years ago to become a Synod Exec. but had just returned to Nebraska to pastor I church. I saw him last fall at a meeting and we had an enjoyable time catching up with each other. Roger had a pastor's heart and was one of the most affirming people I have ever known. I hope you will keep Roger's family and friends in your prayers. He will be missed by many. According to the European Commission's annual social inclusion report, one in six Europeans lives below the national poverty line, while 10 percent of people live in households where there is nobody working, . Conducted in 2004, the study showed that 16 percent of EU citizens lived under the poverty threshold which is defined as 60 percent of their country's median income. The poverty statistics ranged from 9-10 percent in Sweden and the Czech Republic to 21 percent in Poland and Lithuania while in all countries except the Nordic states, Greece and Cyprus, children are often at greater risk of poverty, said the study. The report also found wide discrepancies in life expectancy between the bloc's member states and major differences in spending on healthcare with Estonia spending 5.5 percent of GDP and Germany spending 10.9 percent. Zach Hunter was only 12 years old when he became an abolitionist. During Black History Month three years ago, as he read about Harriet Tubman and Frederick Douglass, he thought he, too, would have fought against slavery if he'd lived back then. But to his astonishment, Zach found soon afterward that people are still held as slaves today. "When I learned there were about 27 million slaves in the world, it blew me away," says the high school freshman from Atlanta. "I wondered what I could do." He noticed loose change lying around the house, and a project was born. He formed Loose Change to Loosen Chains, and with the help of friends, collected some $10,000 to fight modern-day slavery. This year, Zach is part of a much broader antislavery initiative, serving as student spokesman for "The Amazing Change." Next month marks the 200th anniversary of the end of the British slave trade, which was spurred by a young parliamentarian and reformer, William Wilberforce. A feature film on Wilberforce, "Amazing Grace," opens in US theaters nationwide on Feb. 23. The filmmakers are partnering with modern antislavery organizations to enlist students and others in a contemporary abolitionist movement. (See: www.theamazingchange.com). For his part, Zach has penned a book, "Be the Change," and travels across the country to speak to young people at music festivals, schools, and churches. The Amazing Change campaign encourages people to sign a petition to end modern-day slavery, donate to the cause, and learn how they can take an active part in the movement. A percentage of funds donated will help four nonprofit groups (Free the Slaves, International Justice Mission, Rugmark, and Child Voice International) collect evidence, go to court to free people from current forms of slavery, and help former slaves establish a new life. While slavery takes different forms today, the impact remains devastating to lives around the globe, according to UN and US government statistics. An estimated 300,000 children have been forced to serve as child soldiers in more than 30 conflicts. Each year, human trafficking for sexual servitude or forced labor moves 800,000 people across international borders, including some 17,500 foreigners trafficked into the United States. Some 200,000 people are considered to live enslaved in the US. The number of bonded slaves – men, women, and children who toil in agriculture or industries – has reached an estimated 20 million worldwide, says Free the Slaves. While total figures for slaves vary (the International Labor Organization has used 12.3 million for forced labor and sexual servitude), the 27 million estimate Zach Hunter cites is widely supported. Are you ready to fire yourself? Presbytery and synod representatives, gathered in Albuquerque, N.M., Feb. 14-16, seeking ways to salvage their governing bodies. In the process they were asked to risk losing their careers. The task force was set up after mounting "public concern" about the sexualisation of young girls. After that fateful night, Ripsi claims she had no memory of the events and is somewhat apologetic (although she brags about her privileged background with one of the girls she attacked), but the fallout is already decided: Ripsi has to leave the house (view the video here). As she’s packing to leave, Ripsi shows great disdain for her possessions, giving away a $500 designer dress to one of her housemates. Too lazy to carry her bags, she simply kicks them down the stairs and lets them land where they may. "I just wanna be happy, I’m not happy. Nothing in the world makes me happy. I could shop until I drop. I could go out with my friends. But there’s a void in there. I have been looking for something my whole life and I don’t know what it is. I just know that I haven’t found it yet." If this quote isn't the description of the consequences of the self-centered consumerist mentality of our age, I don't know what is. Too often I think we fail to realize the quite desperation that is behind the antics of so many obnoxious annoying people. Years ago I was part of a church group where this guy would regularly attend. He was surly, impatient, foul-mouthed, and just generally not a nice guy to be around. I remember someone asking one time "What will you do when you enter heaven?" Some talked about going to meet Jesus. Others talked about finding old family and friends. When the question was put to this guy he quitely said "I think I will probably spend the first 1,000 years on my face at Jesus feet." We often just don't know what is lurking behind those annoying exteriors. Bradley Wright's Blog: Why do Christians use statistics badly? Still, as Smith implies, evangelical Christians may be the most ironic abusers of statistics. Christianity is based the reality of spiritual historical events (especially the life, teaching, death, and resurrection of Jesus) and their implications for people today. Given the centrality of “objective truth” in Christianity, it’s more than a little ironic that we settle for made-up and manipulated “facts” about Christianity today. From Pier 39 in San Francisco: See the most watched YouTube stars as they meet for the 'As One' meeting, hosted by Cory Williams-- better known as "Mr. Safety." An interesting video about a meeting of YouTubers in San Francisco Saturday. Here is a short article about it: Top YouTube videographers descend on S.F. Bruce Metzger, an expert on Greek biblical manuscripts, died Tuesday at the age of 93. The professor emeritus at Princeton Theological Seminary died of natural causes. Born in 1914 in Middletown, Pennsylvania, Metzger was educated at Lebanon Valley College, Princeton Theological Seminary, and Princeton University, where he earned his Ph.D. in Greek and Latin classics in 1942. In 1939, he was ordained in the Presbyterian Church. At the time of his death, he was the George L. Collord professor emeritus of New Testament language and literature at Princeton Theological Seminary. Metzger taught in the New Testament department at Princeton for 46 years, beginning in 1938. Metzger was well known for his work in New Testament textual criticism. He served on the committee that produced the United Bible Societies' Greek New Testament and wrote several books on textual criticism, including The Text of the New Testament: Its Transmission, Corruption, and Restoration (1964, 1968, 1991) and Manuscripts of the Greek Bible: An Introduction to Palaeography (1981). The British Academy made him a corresponding fellow in 1978, an honor that few American scholars receive. Reclaimingthemission.com (David Fitch): Some Reasons Why the Lone "Senior Pastor" Might Not Make Sense Anymore. (HT: Jesus Creed) Mr. Fitch and I appear to be drinking from the same water. Some Reasons Why the Lone "Senior Pastor" Might Not Make Sense Anymore. Five Kansas City firefighters suffered burns this morning during a fire that started about 10 a.m. in a two-story building at 75th and Washington Street. After an apparent “flashover” engulfed the firefighters, battalion chiefs ordered all firefighters out of the building, sent in a rescue team, took a head count to make sure everyone was safe and called for a second alarm to get more fire equipment on the scene. Multiple ambulances responded and transported six firefighters to area hospitals. One did not need treatment, one was treated and released and the other four have been admitted to the burn unit at the University of Kansas Hospital. This fire happened just six blocks east of the Church where we worship. All I can say is that emergency responders are some of the most amazing people there are. It is always heartbreaking to hear about any of them injured in the line of duty. I hope and pray for the health and well being of these men. SOME of the hottest nightclubs have a new trick for checking the identity of their VIP guests: they send an entry pass in the form of a super barcode to their mobile phones. This is scanned by the large gentleman who lifts the velvet rope. Even those who must pay to get in may need their handsets: at a recent clubbers' night at London's Ministry of Sound, students were offered discounts if they used their mobile phones to buy electronic tickets. Mobile phones are becoming an increasingly popular way to make all sorts of payments. In America fans of the Atlanta Hawks have been testing specially adapted Nokia handsets linked to their Visa cards to enter their local stadium and to buy refreshments. Elsewhere schemes are more advanced. You can already pass the day in Austria without carrying cash, credit or debit cards by paying for everything, including consumer goods, with a mobile phone, says Arthur D. Little, a firm of management consultants. It reckons worldwide payments using mobile phones will climb from just $3.2 billion in 2003 to more than $37 billion by 2008. Pre-paid or “smart” cards, like those used by Hong Kong's Octopus and London's Oyster for travel on subways, provide a lot of convenience—and for operators as well as passengers, because money is expensive to handle. Transport for London says in the three years since it introduced Oyster, the cards now account for three out of four journeys on the underground and buses. Cash payments for tickets have fallen to just 5%. It has helped to boost usage with differential pricing: tickets bought for cash cost a lot more than using a smart card. Having spent fortunes on branding, credit-card firms and banks do not want to see other payment systems gain ground. This presents a threat to banks, says Dan Schatt, of Celent, a research company. Historically, banks have controlled both the hardware (chequebooks and debit/credit cards) and the distribution (branches, websites, etc). Mobile-phone banking and contactless smart cards could escape some of their control. Banks could lose customers, says Mr Schatt. Or will they? Banks and credit-card firms say that if cash is replaced by mobile phones, they intend to be part of the transition. A decade ago some observers predicted that internet banking would render retail banking from high-street branches obsolete. But JPMorgan, Bank of America and others are adamant that people are nowadays using bank branches more than ever. Even if the phone and the smart card replace cash, who gets to collect the fees remains open to contention. Update: Usually I just link articles that don't require subscription. The Economist has a mixture of free and subscription only articles. I link these to encourage others to check out the article. I goofed and thought this was free. The article is in the print edition but is lengthy. Here is a bit more about the technology. The various “contactless” payment systems rely on a technology called “near-field communication” (NFC). The NFC device within the cards reacts when placed close to a reader or touched onto one. The machine induces an electrical circuit in the NFC device, which allows a short exchange of data to effect a transaction, such as deducting a fare from the stored value. As NFC devices can cost only a few cents they could be inserted into every mobile phone. The idea is that instead of carrying another piece of plastic, just the phone will do. Payments made from those using stored-value are seen as relatively low-risk. Merchants are guaranteed payment and if the cards or phones are lost or stolen the cost to users is limited. But mobile phones can be much smarter than smart cards. They can be de-activated remotely; they have a screen which can show information, like a credit balance and product information; they have a keyboard to enter information and they can communicate. This means they can also be used to authorise larger payments by entering PIN codes directly on the handset or topped up with stored credit from an online bank account without having to go to an ATM. Jesus Creed (Scot McKnight): Is Emergence the 60s all over again? I lot of good discussion going on with this post. Check it out! Far from being sidelined by society, Renaissance nuns enjoyed a life of considerable enjoyment, social standing and power. THE very thought of nuns stirs up images of dark-panelled Victorian rooms, smells of polish and cooking cabbage, the swish of long black robes and the peculiar, creepy softness of holy voices. Silvia Evangelisti, who specialises unpromisingly in “gender history” at the University of East Anglia in England, presents a radically different and intriguing picture. The Kansas City Emergent Cohort met tonight at the Wesport Coffee House. Susan Cox-Johnson did a post about our gathering. She also posted a picture. The strikingly handsome profile at the right of the picture would be yours truly. I'm a Double Lottery Winner! OMAHA, Neb. 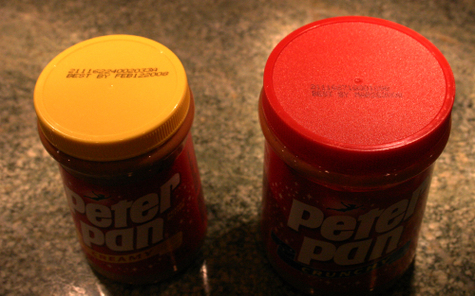 (AP) - ConAgra Foods Inc. told consumers to discard certain jars of Peter Pan and Great Value peanut butter after the spread was linked to a salmonella outbreak that has sickened almost 300 people nationwide. Well, Mrs. Kronicle went to the cupboard and pulled out the peanut butter. What did she find? VIRGINIA BEACH, VA. -- Despite the diminished influence of Christian conservatives in the 2006 election, and amid signs that the "God gap" separating Republicans and Democrats may be narrowing, religion remains an important factor in electoral politics in this country and is likely to play a decisive role in the 2008 presidential race. Yet exactly how religious values will infuse the political debates, and which candidates stand to benefit the most, are far from clear. NEW YORK - The newest $1 coin, bearing the likeness of George Washington, was rolled out Thursday, with the U.S. Mint hoping Americans will want to buy George. Commuters bustled past the unveiling at a Grand Central Terminal event replete with marching music and a George Washington re-enactor. Crowds of collectors and the curious lined up in the station's cavernous, chandelier-adorned Vanderbilt Hall to exchange their paper Georges for metallic ones. "I think it's cool because we get to see a coin with the first president on it," said 7-year-old Jack Garbus, an avid coin collector and second-grader from Valhalla, N.Y., who was taking advantage of a school snow delay to be at the event. The new coin is going into circulation around the country just in time for next week's celebration of the first president's birthday. The design on the coin will change every three months, featuring a new president in the order in which they served. In that way, the Mint hopes to attract a following similar to the more than 125 million collectors who are participating in the 50-state quarter program. I gotta admit, I like coins, but I suspect I am in a minority. I have witnessed the attempted introduction of the $2 bill and two tries at dollar coins in my life. Not sure why they think this will work any better but we will see. SAN FRANCISCO -- For most of the past 37 years, the dinner dress code was coats and ties for men, skirts or other "appropriate attire" for women at The Sequoias, a high-rise retirement community. But the newer, younger residents lobbied successfully for more casual dining. More than two years later, some of the old-timers are still grumbling. "There is a definite generation gap between the ones who have lived here 20 years" and more recent arrivals, said 82-year-old Hilde Orloff. At retirement communities around the country, a rift has opened up between the 90-year-olds and the comparatively spry 70-year-olds, between the generation that came of age during the Depression and the one that reached adulthood amid postwar prosperity. Just more evidence that the generational cohort you grow up with has a lifelong impact on you. You are an accomplished artist with a studio and teach art classes at a college. You got married a few years ago and now have two small boys at home. You decide to be a stay at home mom but where do you find the time for a creative outlet? More brainstorming was done on my pet project "Naptime Studios". Recruiting "Moms" to participate. So far I have enlisted 4 others besides myself, and will invite 7 more to join. Am putting finishing touches on rules and materials and am in the process of gathering all the materials needed for each "Naptime Kit". You can see some of the work she has posted at her blog by scrolling through here posts and you can learn more about her ideas at this post and this post. So if you are interested, I would invite you to check out Erin’s blog and see what develops. But do so quietly. Max and Liam may be taking a nap. The notion, however, that spiritual, or theological, or other “Christian” expertise should not be paid for is utterly foreign to the Bible. From the Old Testament requirements that generous provision be made for the priests to Paul’s commands in the New Testament that pastoral workers are worthy of their wages and should be paid such (I Corinthians 9), the Bible believes that people in such occupations are worthy of both esteem and financial support. Indeed, we show our esteem precisely in the financial support we give them. The latter problem of simply undervaluing such Christian service, however, is a problem in our hearts, not our heads. And the Bible is plain: We undervalue our spiritual teachers at the peril of undervaluing the divine truth they bring us. God frowns on such parsimony. Ben Witherington: "Amazing Grace"-- The Story of William Wilberforce. Here is Ben Witherington's review of the movie. I hope to see it next week.